Shoji Ueda, a Japanese photographer born on March 27, 1913 in Sakai, Tottori Prefecture, is known for his surrealistic photographs. 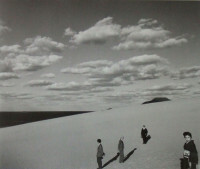 Among them, his portraits taken on the sand dunes of Tottori are the most celebrated. In 1930, Ueda received his first camera from his father, and one year later he moved to Tokyo to attend the Oriental School of Photography. 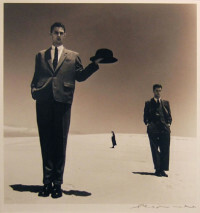 After graduating at the age of nineteen, he returned to his hometown and opened his own photo studio, Ueda Shashinjo. In the same year, he joined the Japan Photography Association and began to establish a reputation as a professional photographer. Ueda married in 1935; his wife and three children are recurring models in his works. 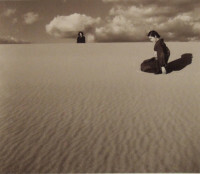 During World War II, Ueda kept away from photography, not willing to serve as a military photographer. Shortly after the war in 1947, he resume his career. In 1954, He won the Nika Prize, and in 1958 his works were selected for exhibition "Japanese Photography" at the Museum of Modern Art in New York. The Shoji Ueda Museum of Photography, dedicated to his works, opened in Kishimoto, Tottori Prefecture in 1995. Ueda died of a heart attack on July 4, 2000.